General Sir Nick Carter warned Russia, China, Iran and sadistic terrorist organisations like ISIS are a colossal threat towards the UK. He said Britain’s security, stability and prosperity are being challenged by the “ambitious” superstates. He admitted, “the multilateral system that has assured our stability since 1945 is threatened” and mass migration was “arguably an existential threat to Europe”. Mr Carter said, in his first lecture as Chief of the Defence Staff at the Royal United Services Institute, that Russia and China had “studied our strengths and invested carefully in new methods and capabilities that are designed to exploit weaknesses”. These included ballistic and cruise missiles, low-yield nuclear weapons, cyberweapons, space and counter space weapons, and electronic warfare. The UK must now shift away from our peacetime mentality and embrace the innovation to stop these threats to our national security. He said the UK needs to take risks and experiment with new technologies. Mr Carter added: “It inevitably brings instability which requires a different approach to the traditional peacetime mentality. Looking to the future, he said the UK military would be “digitally enabled and integrated”, and change how it fights and develops capabilities. The Chief of the Defence Staff also said Iraq and Afghan war veterans were “pitied” by the public rather than respected. He said the younger generation of veterans are misunderstood because of dramas, documentaries, films and even charity campaigns that portray them as “scarred for life”. He said the imaging was making it harder for the military to recruit. In a bid for support he said: “While our servicemen and women appreciate public support, they want to be valued and respected – not pitied – in other words, it’s about empathy, not sympathy. “The respect and honour shown to our Chelsea Pensioners proves that as a nation we value our older veterans. Despite declining to name a specific programme, BBC1’s hit series Bodyguard, which was watched by 10.4 million viewers for its final episode, had at its centre a “troubled war veteran” tasked with protecting the Home Secretary. 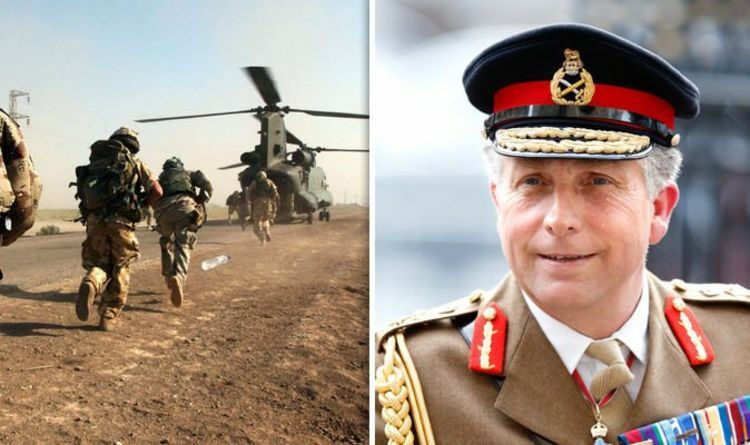 Sir Nick said modern-day veterans were often thought of as “scarred for life”, “homeless”, “have turned to alcohol or drugs because of traumatic stress disorder”, or “are more likely to go to prison”.